Want to breathe more fire into your shred guitar playing? Most guitarists think that playing shred guitar is ‘only’ about playing every note ‘as fast as possible’. Fact is, if you take this approach, your lead guitar licks will end up sounding boring and repetitive. This is because playing awe-inspiring shred guitar goes beyond merely being able to play fast. In addition to playing fast, you must also understand how to creatively use the notes you play to make your guitar phrases ‘stand out’ and capture the attention of anyone listening. I will take you through the process of quickly and easily making your shred guitar licks more intense without playing faster. However, before you go through the steps in this exercise, it is crucial that you watch this shred guitar video so you can see and hear the concepts I will be discussing. By watching the demonstration in this video, you will be able to go beyond the examples in this article and easily create awesome new shred guitar licks of your own. Watch the video below right now, then come back and complete the steps in the exercise on this page. Now that you have watched the video above, follow the steps below to improve your shred guitar playing. 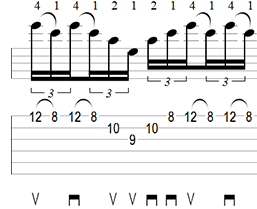 Step Two: Play through the pattern several times (at whatever speed you are comfortable with). Step Three: After playing the original pattern straight through several times, begin ‘repeating’ the highest two notes in the pattern every time the arpeggio starts over (exactly like you saw/heard me do in the video above). 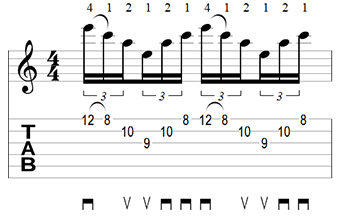 In other words, when you are playing the A minor arpeggio (A C E) and the highest two notes are “E” (12th fret) pulling off to “C” (8th fret), repeat these two notes once as you are descending in the pattern like this: E – C – E – C (and then continue the arpeggio). As you heard in my video demonstration, adding these two notes changes the overall contour of the phrase and causes the notes to be emphasized in a much different manner than how they were in the original pattern. By using this approach in your lead guitar phrasing, you will instantly make any shred guitar lick sound totally badass. Step Four: Repeat the new variation you just created in the previous step several times. Then create 1-3 ‘additional’ variations by changing the highest note in the arpeggio pattern to a different note. 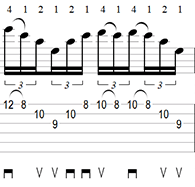 For example, instead of always playing “E” on the 12th fret, play “F” on the 13th fret or “D” on the 10th fret. Now repeat the same concept from the previous step using the new highest note in place of the old one. Play through your new idea several times. Once you have gone through all the five steps of this shred guitar exercise, begin integrating this concept together with other types of licks and techniques (this exercise is NOT exclusive to arpeggios only). 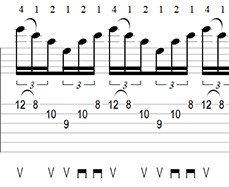 Replace the arpeggio in step one with any other guitar lick you want and use the basic concept of ‘breaking the contour’ of a straight ascending or descending phrase to create the same super intense feeling. 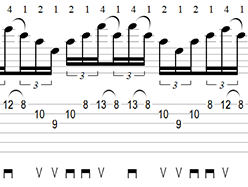 Then simply repeat steps 2-5 and begin creating an endless supply of killer shred guitar licks. By integrating the ideas of this exercise into all areas of your playing, you will add a lot more creativity into your shred guitar licks! Enhance any of the shred guitar licks you created in the exercise above by watching this guitar phrasing video and learn how to play creative guitar solos. Become a better lead guitar player by studying rock and metal guitar lessons online.